Though he's been a subscriber since the 1960s, Mayo's Michael Joyner, M.D., tells us the April 3, 1978, issue of Sports Illustrated magazine, in particular, stands out in his mind. In that issue, a writer and English professor by the name of Michael Baughman wrote a detailed first-hand account of his experience running down (in the most literal sense) a wild deer near his home in Oregon. "I still remember reading that article," Dr. Joyner tells us. Baughman's story has stayed so fresh in Dr. Joyner's mind in fact, that he routinely brings it up at scientific conferences whenever someone starts talking about the endurance running hypothesis. This is the idea, Dr. Joyner says, that as humans evolved, changes in our bones and muscles, along with "an impressive ability to regulate our body temperature," have allowed us to become strong endurance runners (if we so choose, of course). This has generated a good deal of scientific research and commentary in recent years and has "contributed to the barefoot running movement," Dr. Joyner writes in a blog post for The New York Times. When that idea comes up, "I always say, didn't some guy write an article about this back in the '70s?" Dr. Joyner says. "And they all just scratch their heads. "So earlier this month, Dr. Joyner, whose research includes investigating how we humans "respond to complex challenges like exercise, heating, standing and mental stress," tells us he decided to track down the now 76-year-old Baughman and talk to him about why he decided to run down a wild deer in the first place and what it took to do so (hint: three or four attempts and about 15 miles of running). Afterwards, he shared their conversation via The New York Times Well Blog. 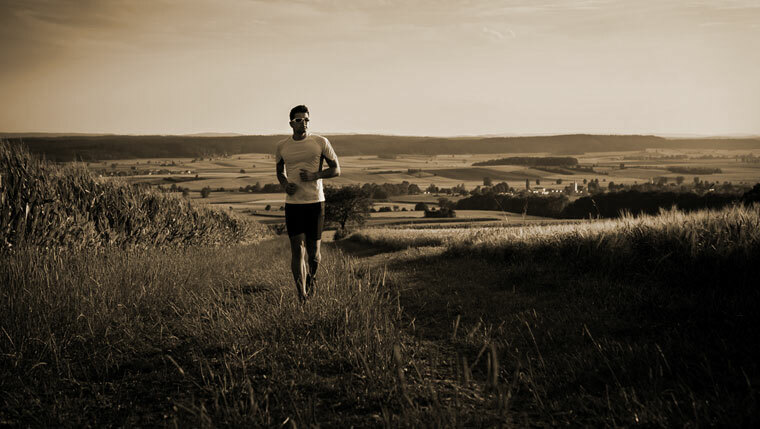 Dr. Joyner calls the endurance running hypothesis the biggest new idea in exercise research in recent years, and says the idea comes from the scientific belief that as humans evolved, we developed an innate ability to run long distances to allow us to take down wild game for much needed food. "It's very similar to what you see when a wolf pack hunts caribou," Dr. Joyner says. "It's a very similar strategy where a group of three or four people, working together, would know the terrain well enough to be able to run a wild animal down." Having the right terrain, is key, Dr. Joyner says. "A deer will sprint for 200 yards and then stop ... Then as you get closer, the deer will start running again." Eventually, the animal will become exhausted, while the human, in theory, plods on. The Deer Runner, as Baughman was known, was 40 years old at the time and says he had done several marathons but was not a distance runner, tried several times before outlasting his "prey" one 80-degree day on ranch land near his home in Oregon. When the deer finally stopped, Baughman "talked to him soothingly" and "touched his sweaty flank" then walked away. He then grabbed an apple from a nearby tree for his effort and ran the 15 miles back to his car. Call us crazy (many do), but we'll stick with simply running to our local grocery store for now. Nonetheless, you can read Dr. Joyner's interview with Baughman here. Then, let us know what you think about this story and others by sharing your comments below.